Notebooks I've filled up just this calendar year. I used to write everything down. In college 13 years ago, there was no iPhone for me. No App Store with great organization apps, no awesome Getting Things Done pieces of software for my Mac. It was just my 12-inch PowerBook, Microsoft Word 2003 (yuck! ), and the web. That was about it. Alongside that, though, I had a steady stream of notebooks. Mostly Moleskines, and I would write nearly everything down. Even if it didn't matter, I would write it down. I wasn't too particular about pens or pencils or even the notebooks I chose to write in. And it worked. Somewhere along the way, I abandoned pen and paper. In an effort to become more streamlined and paperless, I put my notebooks in storage and started to use apps like Things and Simplenote to keep track of all my tasks, and later Elements and Editorial to organize all my text files. It was good (and still is), but keeping track of everything was difficult. Long-form writing and classes and sermons was ideal; small notes and bits of text was not. And as a minister, I live in small notes and bits of text. This past year I've fallen back in love with Field Notes. 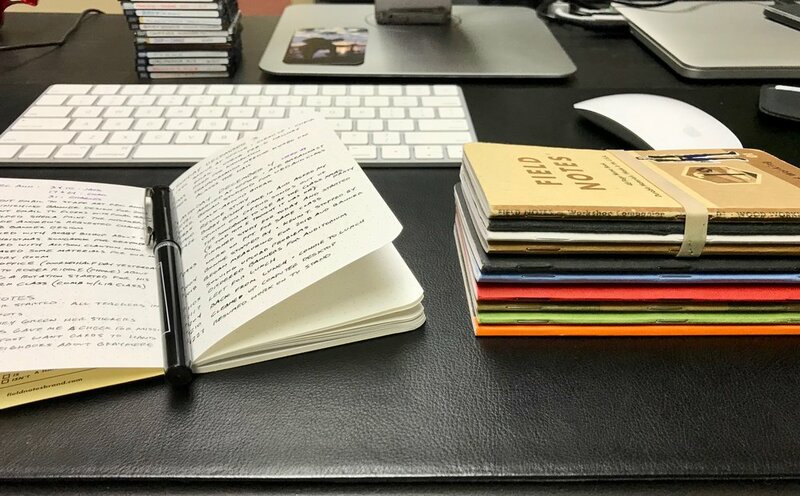 In case you're not familiar with them, Field Notes are little notebooks, just a little bit bigger than a standard index card, with durable covers and high-quality paper. They're perfect for your pocket and durable enough to carry around with you anywhere. Current Field Notes collection. Yes I have a problem. Just in the last 6 months alone, I've filled up 10 notebooks. With what, you ask? Everything. It has greatly helped me be a more productive father and minster when I just write everything down. It may seem silly to you, but writing everything down in an analog way has helped me in a way digital never did. It just seems easier to forget anything that was typed out on a tiny keyboard. The more I find myself using my iPhone and its apps as a communication and organization tool and not the by-all end-all, I find I'm more productive in my day-to-day work and relationships. Sample of my Daily Log. For example, I've started keeping a daily log. It has been extremely valauable for me to look back at my workdays and see exactly what I did at any given time. It's not as cumbersome as I would have thought, it helps me with accountability and gives me a reference and record on the many different things I do throughout the day. Plus if anyone ever says, "What do you do all day?" I can just say, "Here." I've also found my retention better when taking analog notes, especially during sermons or classes. There's science behind this. I sometimes try to sketchnote, which is just a fancy way of saying that I draw out pictures and doodles as I take notes. For example, when Andrew is preaching he might mention a verse that has the word "gift"in it, and I'd draw a small package with a bow. Sketchnoting helps break up the layout of just text in your notes and it's also good fun. I highly recommend Field Notes, but there's some bigger formats that might interest you like the Panobook from Studio Neat or even the Dime Novel Field Notes special edition. As everything moves more and more digital, I find myself going back to analog to keep track of things. If you're not locked into a system where you work and are able to go back to analog note taking, I'd say give it a try for 30 days and see how much more productive you are. You might be surprised, like I was, on how much better you remember things by writing them down with good 'ol pen and paper.